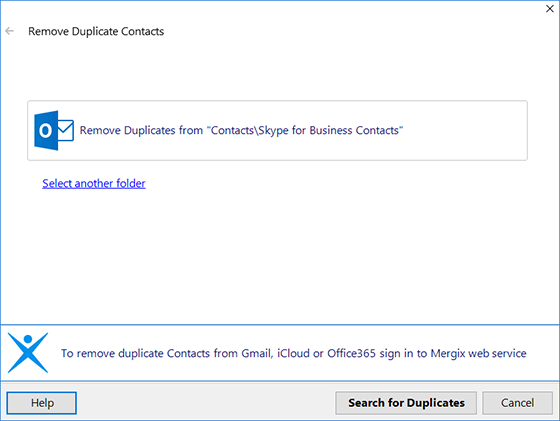 Remove Outlook duplicate contacts automatically using 4Team Duplicate Remover. 4Team Duplicate Remover is an easy-to-use tool for searching and removing the duplicate contacts in Outlook. Remove Outlook duplicate contacts, merge Outlook contacts and clean up your address book. Remove duplicate contacts in Outlook 2016, 2013, 2010, 2007 as well as duplicate contacts in Outlook 2003. This software use an advanced algorithm to find and delete duplicate contacts. Only those contacts that contain the same information in same fields will be deleted or merged. Outlook Duplicate Remover stores all the deleted copies in “Deleted Items” folder, so all deleted contacts are backed up. In case an important contact was removed there is an option to restore the deleted contact from the “Deleted Items” folder. Duplicate Remover also finds Junk Contacts that contain too little information and allows editing them easily. When you are editing the Junk Contacts’ fields, the software will automatically offer you the closest value from all existing Outlook Contacts, so empty fields can be filled in quickly. Outlook Duplicate Remover is the latest duplicate removal add-in software from 4Team Corporation. It is a fully automatic tool to remove duplicate contacts without any settings to adjust. In case you want to delete each one of your duplicate contacts manually, and especially if your address book contains a large number of contacts, it will take a very long time to delete all the existing duplicates. Using Duplicate Remover with just one click of a button you will remove duplicates in all Outlook folders. Even if thousands of duplicates are spotted, they will be removed in less than a minute. Using Outlook Duplicate Remover software can save precious time and help you to easily remove duplicate contacts from your Outlook. Try NEW Mergix. Remove all duplicate contacts that appear across Outlook, iCloud and Google accounts. The semi - automated tool will save your time while organizing your contact list: cleaning up duplicates, merging similar and removing junk contacts across your main contact sources – Outlook, Gmail and iCloud. Get rid of all duplicated contacts on your PC, iPhone, iPad or Android devices, by cleaning your contact sources with Mergix. Click here to learn more.